Could a social robot collaboratively exchange stories with children as a peer and help improve their linguistic and storytelling skills? Tega uses machine learning algorithms to learn actions that improve children's storytelling and keep them engaged. We are also interested in how Tega can personalize its interaction with each child over multiple encounters, because every child learns and engages differently. In Spring 2017, Tega went to twelve preschool classrooms in the Greater Boston area for three months, pioneering the field of long-term human-robot interaction. Using Q-learning, a policy was trained to tell stories optimized for each child’s engagement and linguistic skill progression. Tega monitored children's affect signals and asked dialogic questions during storytelling to gauge their engagement. Tega also invited children to tell it stories, which Tega used to assess each child's linguistic skill development. Our results show robot's interaction policy indeed personalized to each child. At the end of the sessions, the policy significantly differed from one child to the other. Children who interacted and built relationships with a personalized robot showed higher engagement, learned and retained more vocabularies, and used more complex syntax structure in their speech compared to where they had started. Tega exchanges storytelling with a preschool child. Tega learns to personalize to each child over multiple encounters. As can be seen from our results, social robot learning companions hold great promises for augmenting the efforts of parents and teachers to promote learning, academic knowledge and the well-being of children. Social robots can physically, socially, and emotionally play and engage with children in the real world. They can be designed to interact with children in a collaborative, peer-like way during playful educational activities. 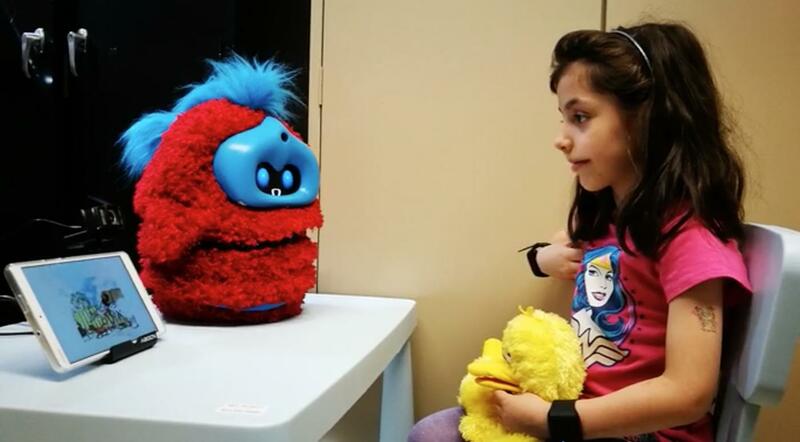 The interactions between a child and a robot resemble the speech acts between children and adults or peers, and offer a unique opportunity to personalize social interactions to promote areas of development important for learning. When a child enters Kindergarten, she is a unique distribution of the various cognitive, visual, social and linguistic skills needed to be a successful reader. However, in at-risk communities, it is almost impossible for a Kindergarten teacher to offer a curriculum that addresses the diverse cognitive and pre-literacy starting points upon which children enter school. Young children would clearly benefit from personalized instruction that can measure and adapt to many intersecting domains of skills and abilities during the process of learning to read and storytell. That's where our research contribution lies.